I've been telling myself that I need to collect my thoughts before writing about the food in Venice, but now I'm running the risk that it will slip away so I had better begin. We spent less than 48 hours in the city, getting to enjoy two dinners, two breakfasts and only one real lunch. Oh, and two gelatos. One would think that it would be easy enough to summarize such a short experience but not so. Venice. My God, it was stunning. All of my senses were fully expanded and indulged. I wanted to express it all here, but I realize now that I'll be lucky if I can just give you flash impressions. This will be the first of several. So! Did you know that they have eensy, beensy shrimps there? All (most?) of the seafood in Venice is small. The lagoons surrounding Venice are teeming with seafood but it grows small, delicate and is intensely sweet. One of the first things I was given to eat (as a little appetizer to an excellent dinner at Antiche Carampane) was a paper cone filled with tiny, fried shrimps (schie) with the shells still on. Tiny as in only an inch or so long. Shells were so delicate as to crunch ever so lightly along with the perfectly fried batter. We ate them with our fingers, licking the salt away, while drinking prosecco and waiting on our meal to arrive. We sat in a narrow alley, lined by centuries-old stone and brick buildings, several stories tall. The moon was nearly full and high in the sky. Dinner took hours, despite the fact that we could only fit in three courses. Here, I had my first fritto misto, a platter of the freshest possible selection of seafoods of the day, along with small bits of vegetable like slivered eggplant, dipped in a very light batter and fried quickly and beautifully. Delivered piping hot to the table, it was impossibly delicious. More tiny shrimps, bits of squid and minuscule octopus, sardines, scallop, myriad bites of fishes and so much more. Each was perfectly fresh, perfectly tender crisp, exquisite. I think it's my new favorite thing to eat. Pity that I'll maybe get to eat it only a few more times in my life unless I win the lotto and run away to Venice forevvvaaaaah. Also, mixed Venetian appetizers: stewed shrimp on polenta, mackerel in tomato sauce on polenta (remind me to tell you that the polenta in Venice is fine, like silk, and that I need to find better polenta here in the States because now, I am spoiled) and mantis shrimps. Mantis shrimps are beautiful by the way. I have no photos of them cooked but here are some from the fish market. Another gorgeous dish was tagliolini with a delicate spider crab sauce. All of this accompanied by a lovely bottle of Tocai. I drank too much of it and can't even remember the dessert but I'm certain we had them and that they were excellent. It's no wonder that the seafood is so divine in Venice. Fishing and fish selling is taken very seriously and the fish markets are a wonderland. We had time to visit the Rialto Fish Market on our last morning and I wandered the stalls of gorgeous (cheap!) fruits of the sea, marveling over them like some girls ogle diamonds. I think I took more photos of raw fish than anything else. * Picnic out of the trunk of a car after mushroom picking in the woods: buttered rolls, liverwurst, goat cheese, salami, herb marinated black olives, sliced honeydew melon and lemonade. * Parasol mushroom and potato pie with sausage. * Assorted coffees, teas and small pastries (waffel, pear tart, chocolate dome, etc). Fortunately, I am walking more than enough to make up for the calorie intake. Tomorrow, we go to Venice. The pleasures that await! 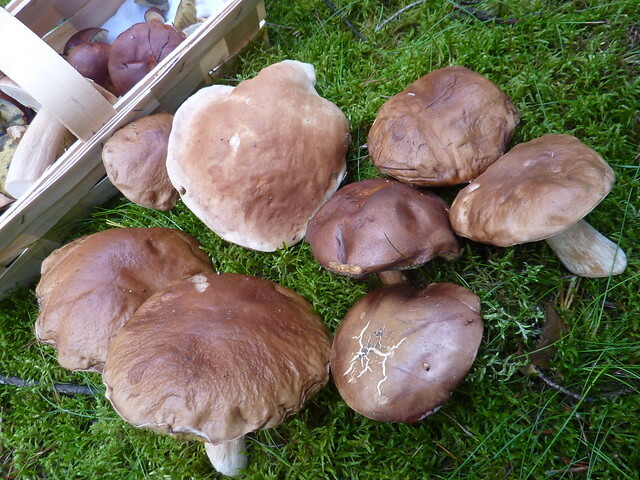 I picked these with my very own hands this morning in the German woods. Do you know what kind they are? I have never eaten Turkish food before so it was quite a treat. We shared several appetizers which included a tomato and cucumber salad, a fantastic humus (liberally sprinkled with sesame seeds and a splash of chili oil), lamb meatballs in a tomato sauce and fried eggplant and peppers. I wish I had paid better attention to what the bread was called. It was delicious. Tomorrow morning, I am leaving for a trip to Berlin, Germany and will also be spending a couple of days in Venice, Italy. 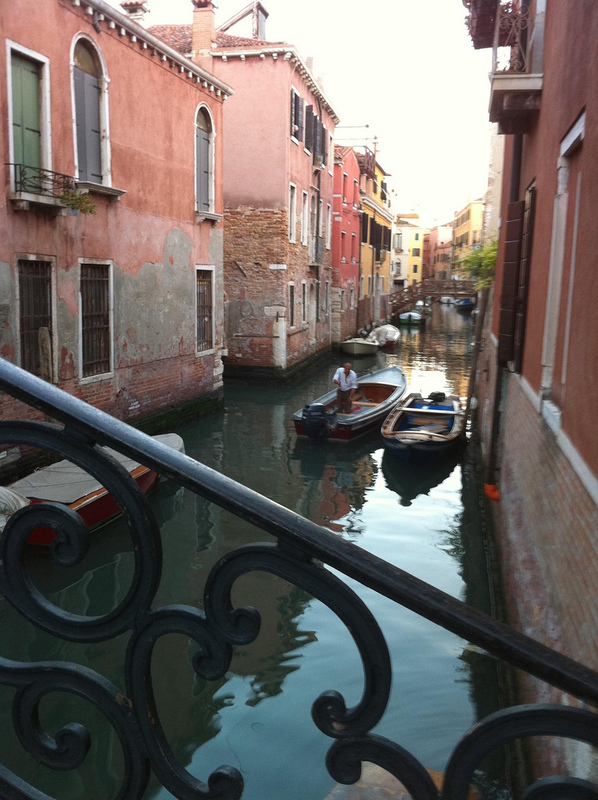 It is impossible for me to adequately express how excited I am to be going to Venice. Ever since I learned we'd be able to go, my insides won't stop bouncing. Venice! I am THRILLED. Beyond thrilled. There may not be any other place on the planet that I have more longed to see. I plan to drink in the texture, the shade and light, the water reflections, the air and the smell and bridges and stones and churches and espressos and wine and art like it's the only thing keeping me alive, then store it up in my mind like a camel stores water. I plan to swallow it alive. Well, as much as can be done in 2 days. Anyone have any recommendations for goodies I should be on the look out for to bring home? Italian chocolates? German jams? I'll do my best to report back on our culinary adventures. We'll see how well that goes (dubious). Wish me luck! I have a new restaurant obsession: Panchita's Mexican Criolla on South Carrollton in the Riverbend area is, by far, the best Mexican food I've had outside of California. Ooooh, it's delicious. Authentic, flavorful, delicious. Handmade, fresh corn tortillas like discs of heaven. Good beans. Really good beans. With lard. So much goodness. Gaze upon my tostadas. One chicken with black beans, one shredded beef with pinto beans and one bean only. Completely fabulous tostadas. I want to tell you about the nuances of flavor and preparation but I was too busy gobbling them up. Bad food blogger! I would have no problem with eating here every day. Has anyone else gone? What did you think? 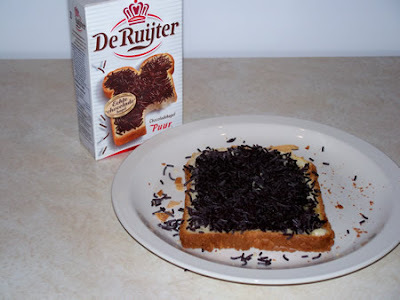 My friend Lisa, in Amsterdam, has been telling me about how different Dutch breakfasts are from American ones. Even better, she wrote a post for us about them! In my travels, I have had breakfast at dozens and dozens of hotel breakfast buffets. In America, the spread is pretty typical: breads (toast, muffins), cereal, scrambled eggs in a big chafing dish, some sausage and bacon, maybe some hash browns. Standard breakfast food. Order from the menu instead and you get pancakes and waffles, an assortment of egg dishes, maybe some sausage gravy. In the South, we always had grits on the buffet (I love buttered grits). Still, it is recognizably what we Americans consider breakfast food. The only place in the US where I have run into a more international breakfast was during an extended stay at the Kyoto Grand Hotel in Los Angeles, right in the middle of Little Tokyo. The vast majority of the guests were Japanese tourists, so waffles and home fries were in short supply on the buffet table. Instead, we could get steamed rice, soy sauce, smoked fish and various vegetables to go with our scrambled eggs and toast. Worked well for me, since I am a big fan of savory breakfast fare – rice and veggies made for a pleasant change. Breakfast here in the Netherlands is really unusual. I was surprised to find on my first trip that our hotel did not offer any hot breakfast food (other than coffee). The only eggs available were hard-boiled. There was yogurt and granola, and sometimes oatmeal, usually with fresh fruit and also fresh vegetables, which you don’t often see on American breakfast tables. My favorite thing about breakfast here? Chocolate sprinkles! It’s weird, but it’s a common Dutch thing – I have seen a lot of our execs having them for breakfast. We’re talking about the kind of chocolate sprinkles that you put on cupcakes here in the US. On the buffet, they come in little boxes and you spread them on your bread, no butter or any other topping, press them into the bread and eat it. It’s like a Dutch poptart or something! I don’t actually eat the chocolate sprinkles, I am just heartily amused by their existence. 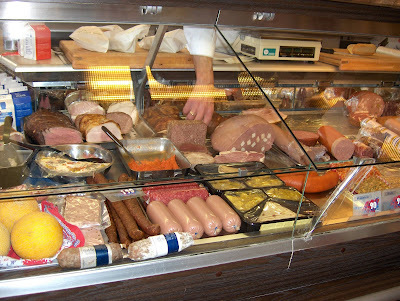 Other features on Dutch buffets are meat and cheese – as in typical lunchmeat style meat and cheese. Every morning, there are also large dishes of sliced tomatoes and cucumbers. My hotel also has hot croissants – plates and plates and plates of them – and they are especially good with hazelnut spread. Oh, Nutella! One of the joys of being in Europe is that little tubs of Nutella are on the table, the way we have grape jam in the US. I usually have a hard-boiled egg, a croissant with hazelnut spread, some cheese or maybe some corn flakes. We have a choice of orange juice or “tropic” juice (which tastes like mango) and coffee or tea. It’s much lighter than most American breakfasts, and much less sweet. Until you add the chocolate sprinkles! Inspired by Bouillie's Random Stuff, here's my top 5 (at this moment) things I love to taste. Guest posting from Amsterdam has got to be among the more glamorous things I can think of. Lisa is a good friend who frequently travels from her hometown, in Ohio, to Amsterdam for work. While there, she eats well and leaves me salivating at the descriptions of her meals. Very kindly, she agreed to guest post for me about the types of food she encounters in the Netherlands. Lisa is an avid reader and writer of a great book review blog, which is full of excellent ideas for a good read. Greetings from Amsterdam! My name is Lisa and I first met Julie when she played tour guide for me in New Orleans. She’s very lucky to live in such a terrific food city – there is so much good food in New Orleans! I work for a Dutch company with facilities all over the world. I have been lucky enough to visit all of our labs in the US, and they are in great food cities like Los Angeles (had the best ramen there) and Houston (burgers at Beaver’s and oysters at Gilhooley’s) and Philadelphia (sushi at Morimoto’s). But lately, I’ve been in Amsterdam and one of the things I love about this city is the food…but not the Dutch food. On my first visit here, my boss told me that the Dutch National Cuisine consisted of bar snacks, and I did fall in love with bitterballen, little meat or mushroom croquettes that you dip in mustard and wash down with good Belgian beer. One of our favorite ways to dine here is to walk from plein to plein, stopping for beer and bitterballen at any outdoor café with an empty seat. It’s a lovely way to spend the evening. The thing I really love about dining out in Amsterdam is the variety – you can find cuisine from all over the world, all right at the end of your fork. 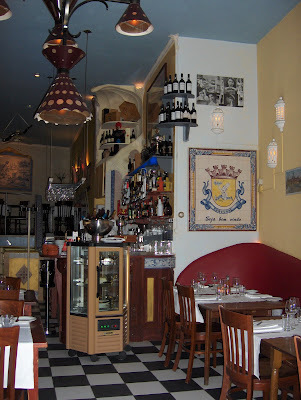 Within just a short walk of our hotel there is terrific Indonesian, Italian, Japanese and North African food. There’s an Irish pub, an Argentine steakhouse and a Hard Rock café with good old American burgers. We’ve passed places serving falafel, sushi and baby back ribs, all along the same street. There are Greek, Catalan, Chinese, Morrocan, Peruvian, Malayan and Indian restaurants; I’m trying to talk my boss into taking us to FLO Amsterdam for French food, because I don’t want this place on my expense report! Later this week, I’m planning to try a Surinamese restaurant, because I don’t think I’ve ever seen one back in the states and I am really curious. We also lucked into some great fine dining. Last week was a special week for the restaurants in Amsterdam, according to the hostess at Elkaar. The restaurants put together special tasting menus and there is a website where you can sign up for discounts and make reservations. We were fortunate that they had an empty spot, because it was the best meal I’ve had in Amsterdam. They brought us amuse bouche of cream of courgette (zucchini) soup topped with a bell pepper foam, along with a roll of beef tenderloin and duck liver, topped with a soy cream sauce. My starter was wine-roasted veal with caper mayonnaise and a veal tartare topped with a baked quail egg. My main course was a bone-in farmhouse chicken with haricots verts, a green bean mousse, confit of chicken and a dutch-style whipped potato topped with tiny mushrooms. For dessert I had a mille feuille filled with a vanilla yogurt cream sauce and red fruit, champagne sabayon and dotted with intensely-flavored dollops of sauce - green apple and black raspberry. Absolutely fabulous food! For someone who loves to try new things, this city is restaurant heaven. You can really find just about anything you’d like to try…as long as you aren’t looking for Dutch food.